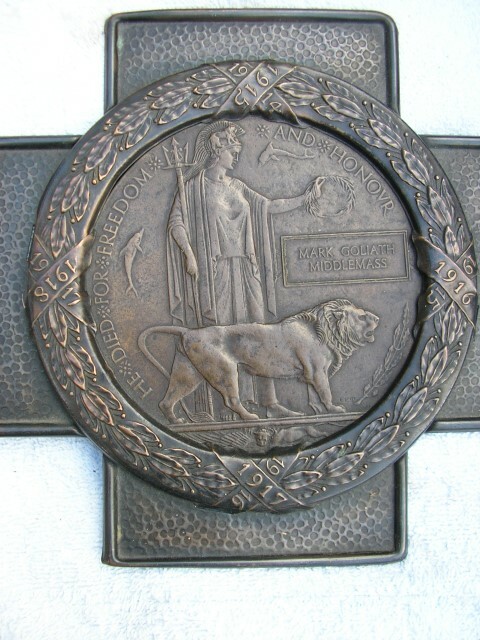 252054 Private Mark Goliath Middlemass, 12th Battalion, Durham Light Infantry was killed in action 27 October 1918 and is buried at Tezze British Cemetery, Italy. He was 35 years old and commemorated on Evenwood War Memorial, the Roll of Honour, St. Paul’s Church, Evenwood and the Memorial Plaque in Evenwood WMC. In 1891, 7 year old Mark lived with his grandparents Mark and Elizabeth Middlemass and his uncle 22 year old John Stokeld and aunt 17 year old Mary Ann Stokeld. His grandfather 60 year old Mark was a green grocer. In 1891, the family home was at Stones End and his parents Mark and Elizabeth lived there with 4 year old Elizabeth and 2 year old Frederick. In 1901, 17 year old Mark lived with his grandmother Elizabeth Middlemass with his Aunt Mary Stokeld and Uncles Robert and George Middlemass. Mark worked as a coal miner (putter). His parents Mark and Elizabeth lived in Evenwood with 14 year old Elizabeth, 12 year old Frederick, 9 year old Mary and 4 year old Robert. Mark worked as a coal miner (hewer). Private M.G. 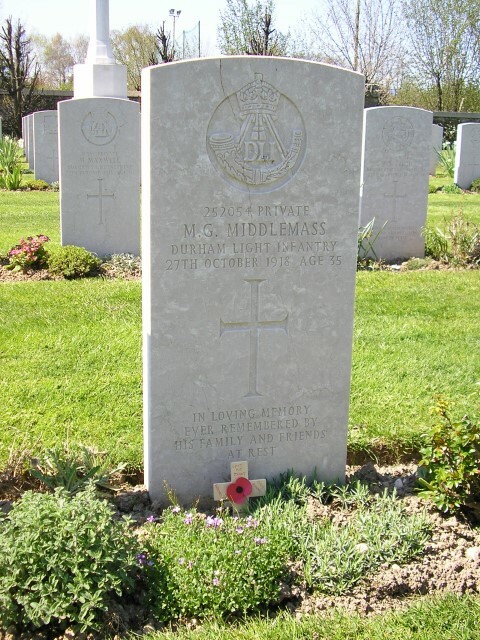 Middlemass had served previously in the 6th Battalion, the Durham Light Infantry. Details of this service have not been researched. 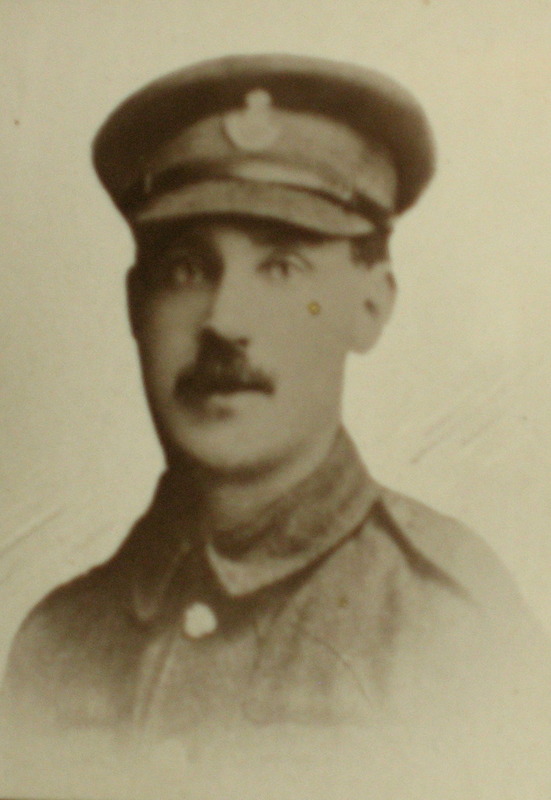 In February 1916 a photo of Private M. Middlemass, 6/DLI of Stones End, Evenwood appeared in a local newspaper. The Italians entered the war on the Allied side in May 1915. Commonwealth forces were at the Italian front between November 1917 and November 1918. The village of Tezze was captured by the Austrians in their advance in the autumn of 1917 and remained in their hands until the Allied forces crossed the River Piave at the end of 1918. 21 October 1918: Commonwealth Forces comprising XIV Corps (7th and 23rd Divisions) took over the part of the River Piave from Salletuol to Pallazon serving as part of the Italian Tenth Army. 23 October: at night, the main channel of the river was crossed using small boats and the northern half of the island of Grava di Papadopoli was occupied, the occupation being completed two nights later by a combined Commonwealth and Italian force. After the capture of the island, the bridging of the Piave proceeded rapidly, although the strength of the current meant that the two bridges built for the crossing were frequently broken and many men were drowned. The Allied attack east of the Piave began early in the morning 27 October. Despite stiff resistance and difficulties with bringing forward supporting troops across the river, the Austrians were forced back over the next few days until the Armistice came into effect on 4 November. There can be no doubt that the Allied forces led by the British heavily defeated the Austrians at Vittorio Veneto and this caused anxiety within the German High Command which influenced their decision to sign the Armistice 11 November 1918. 24.10.18: moved up to Assembly Point A but returned to Catena. “At 6.45am, the advance on to the Green Dotted Line commenced. Very deep, swift water was found in the most northerly area of the Piave and whilst wading this, the Battalion suffered heavily from MG fire, the leading Company losing nearly 50% of its strength. Companies reorganised and pressed forward, to be held up by uncut wire close to the objective, which was strongly held. The wire was cut most gallantly by various parties, amongst whom Capt. Gibbens MC DCM, Sgt O’Hara and Pte Brown were conspicuous. The Battalion pressed on, and C Company captured the first objective. D Company pushed on, overcoming all obstacles and captured the Red Dotted Line (second objective). A Company with B Company (now very weak) pushed steadily on and together captured Blue Dotted Line (the road from C. Padovan to C. Benedetti). Here orders were received as the Italians on the left of the Brigade had failed to cross the Piave, no further advance would be made. The Battalion organised a reserve near C. Borazzuni. Battalion HQ at C. Borazzuni. Major E. Borrow DSO was taken from the Battalion to command the 11th Northumberland Fusiliers, vice Lt-Col St. Hill DSO killed. 27 October: 252054 Private Mark Goliath Middlemass was killed in action. He is buried in the Tezze British Cemetery to the north of Treviso and Venice, north east Italy. Many of those who died on the north-east side of the river during the Passage of the Piave are buried in Tezze British Cemetery. 28 October: at 12.30 the advance was resumed to the Borgo Pin – C. Gaiot. Considerable opposition from the enemy’s rear guard was met with and overcome. Many prisoners captured. Casualties 3 Other Ranks killed 20 wounded. 29 October: midnight – the crossing over the Monticano River, NE of Mareno was seized and the advance resumed with the objective being the Conegliano Cervaro road. “At dark, about 18.00 hours, Battalion HQ with B Company seized the large strong house at K 34.50 52.25 (Vazzola 1/25000) about 200 yards short of the objective and determined to hold this point, and by holding it retain command of the ground won. Largely through the gallantry of L/Cpl Nelson, touch was regained with C and D Companies, and they were moved forward into position. 30 October: The 70th Brigade passed through our front and the 68th Brigade followed in Divisional Reserve…The Battalion went into billets at Orsago at 20.00 hours. Casualties this day: 2 Other Ranks, 3 Other Ranks wounded one missing. 27th October: Major H.St.J.C. West died of wounds, 2/Lt. J. Hodgson killed in action, 38 Other Ranks killed in action. Private M.G. Middlemass was awarded the British War and Victory medals. There can be no doubt that the Allied forces led by the British heavily defeated the Austrians at Vittorio Veneto which caused great anxiety within the German High Command and influenced their decision to sign the Armistice 11 November 1918. Private Mark Middlemass is buried at grave reference is Plot1 Row C, Grave 5, Tezze British Cemetery. The cemetery now contains 356 Commonwealth burials of the First World War.